We are spending a couple of days on a Game Reserve. It is a beautiful place where you are able to make peace with your soul. It was one of Vic’s favourite places. Vic loved the Kruger national Park too and on her last visit there witnessed a Cheetah kill!! When we were told that Vic was terminal she fled to Mabalingwe. When she got divorced – Vic fled to Mabalingwe. This was Vic’s bit of Heaven on earth. Vic has not been able to come to Mabalingwe for a couple of years. The roads are bad and it is a 2.5 hour trip. Just too far for her frail little body. Last year Vic was too ill and it was also Jared’s confirmation weekend. The last time Vic came to Mabalingwe was in 2008. She photographed a herd of elephants. 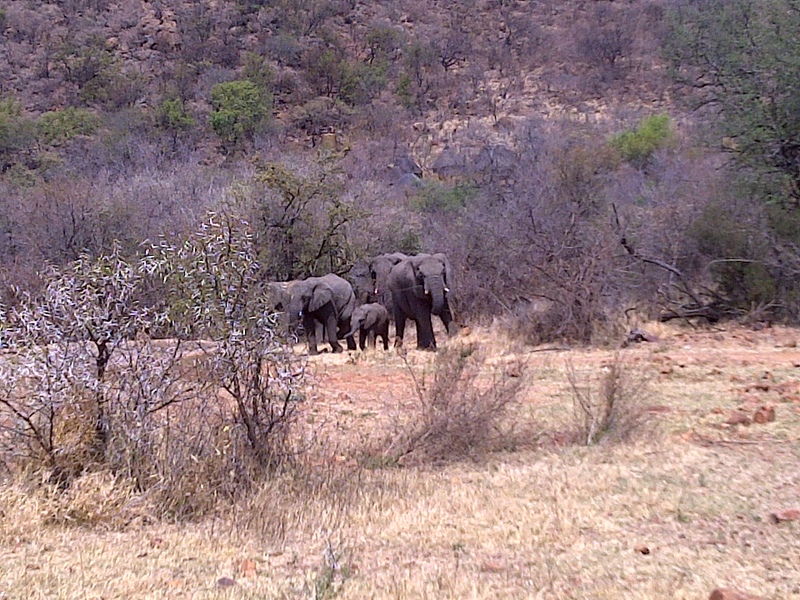 My Christmas gift, that year, was a beautifully framed enlargement of the elephant cow with her babies. Vic wrote a touching note on the back on the picture saying that I was just like the elephant cow – the matriarch of the family. This photograph is one of my most treasured possessions. The first time I was compared to an elephant cow I was appalled! I have however learnt so much about these amazing animals from Vic. A 2005 study in the UK found the creatures displayed traits similar to humans and, coming across the remains of an elephant, would gently touch the skull and tusks with their trunks and feet. It is thought that hovering around the carcass and examining the bones and skull by smelling, touching and moving the bones around, is an attempt to recognize whom it was… Some elephants have been seen to weep and others make sounds associated with grief as they cover the body with leaves and branches before keeping a silent vigil. When a member of the herd has passed away, either due to fights or injury, the entire herd would gather around the dead elephant and stay there, not eating, and not allowing anything near it for 18 hours to 24 hours. Mothers of stillborn infants appear to grieve for days over her dead infant, crying and trying to revive it, before finally moving on. “Elephants, the largest land animals on the planet, are among the most exuberantly expressive of creatures. Joy, anger, grief, compassion, love; the finest emotions reside within these hulking masses. Through years of research, scientists have found that elephants are capable of complex thought and deep feeling. In fact, the emotional attachment elephants’ form toward family members may rival our own. Joy is an emotion that elephants have no shame in showing. They express their happiness and joy when they are amongst their loved ones-family and friends. Playing games and greeting friends or family members all elicit displays of joy. An elephant reunion is a joyful meeting between related, but separated, elephants is one of exuberance and drama. The greeting ceremony marks the incredible welcoming of a formerly absent family member. During the extraordinary event, the elephants about to be united begin calling each other from a quarter a mile away. As they get closer, their pace quickens. Their excitement visibly flows as fluid from their temporal glands streams down the sides of their faces. Eventually, the elephants make a run towards each other, screaming and trumpeting the whole time. When they finally make contact, they form a loud, rumbling mass of flapping ears, clicked tusks and entwined trunks. 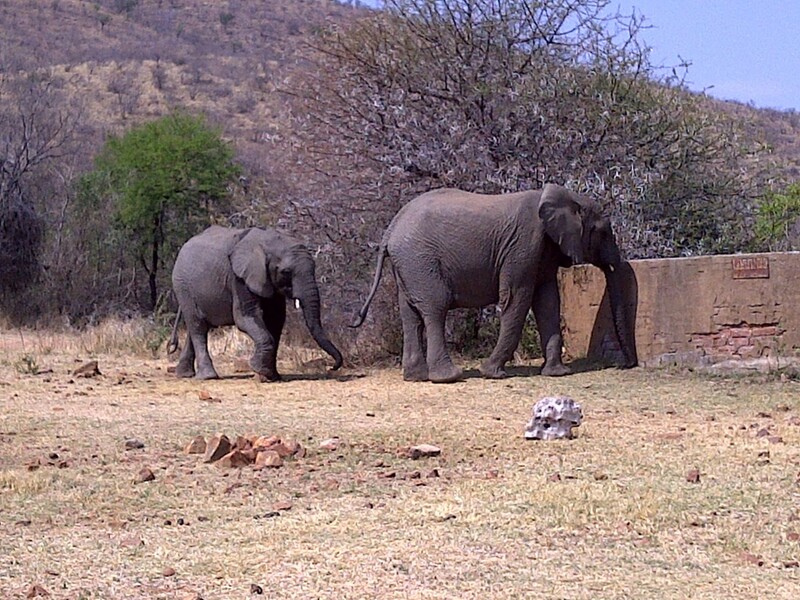 The two leaning on each other, rubbing each other, spinning around, even defecating, and urinating (for this is what elephants do when they are experiencing sheer delight). With heads held high, the reunited pair fill the air with a symphony of trumpets, rumbles, screams, and roars. Bliss. One of the most moving displays of elephant emotion is the grieving process. Elephants remember and mourn loved ones, even many years after their death. When an elephant walks past a place that a loved one died he or she will stop and take a silent pause that can last several minutes. While standing over the remains, the elephant may touch the bones of the dead elephant (not the bones of any other species), smelling them, turning them over and caressing the bones with their trunk. Researchers don’t quite understand the reason for this behaviour. They guess the elephants could be grieving. Or they could they be reliving memories. Or perhaps the elephant is trying to recognize the deceased. Whatever the reason, researchers suspect that the sheer interest in the dead elephant is evidence that elephants have a concept of death. Beautiful story of maternal love. I do agree with your summation, ‘how can mothers be expected to move along’. We grieve not because we are seeking sympathy, but for the lost love of our child that will live forever in our mind… God bless. Shirley your words “We grieve not because we are seeking sympathy, but for the lost love of our child that will live forever in our mind” are so true!!! It is a pain than only a bereaved parent can understand. Much love! Ek hoop dit gaan goed en dat julle die paar dae weg geniet ? Weereens baie dankie dat Ricardo kon saam kom – ek waardeer dit baie – en ek verneem van hom dat hy homself vreeslik geniet – ek hoop net die seuns gedra hulself ? Die rede vir my mail is dat ek wou hoor of julle nog belangstel in die beddens wat ons het vir Stepping Stones ? Ek was die afgelope paar maande ongelooflik besig – maar soos tannie weet is Vicky daagliks diep in my hart gedra – en ek wil werklik nou met alle erns probeer om ‘n bydrae te maak ? Kan tannie my asseblief laat weet waarmee ek alles kan help ? Ek wil regtig so graag help om daardie wonderlike droom van julle te ondersteun waar ek kan – as julle my sal toelaat ? Laat weet my asseblief – en weereens geniet julle vakansie ! Onthou – ek is baie lief vir julle ! This is post and the story in it are beautiful. Thank you for sharing. You’re in my thoughts.